Please try this on black! Just outside the main gardens is the Anthony Chapel constructed of yellow pine. Those windows are 55 feet tall. Liked the shadows that were being reflected on the floor. All woods beyond the windows. Looks great on black! Love the lines of the building and the shadows too! It is so interesting and intricate to look at. It makes you feel like you are outside! Oh my gosh, I think I have the same photo! Never crossed my mind to convert to B&W! did you get the Bell Tower? Awesome. Stunning, especially on black! WHOO! Here's the photo I posted last summer from the Bell Tower: http://365project.org/shirleyv/365/2015-07-31 Never posted the Chapel. It's just quite simply AMAZING! @shirleyv I tried a shot of it last year - didn't come out nearly as well as yours! Think that's neat that we've hit the same shots - have the chapel in horizontal in color and it is beautiful, but needed a b&w for that extra album so I tried the conversion and liked it. I had to lay down on the ground and shoot up for that shot. 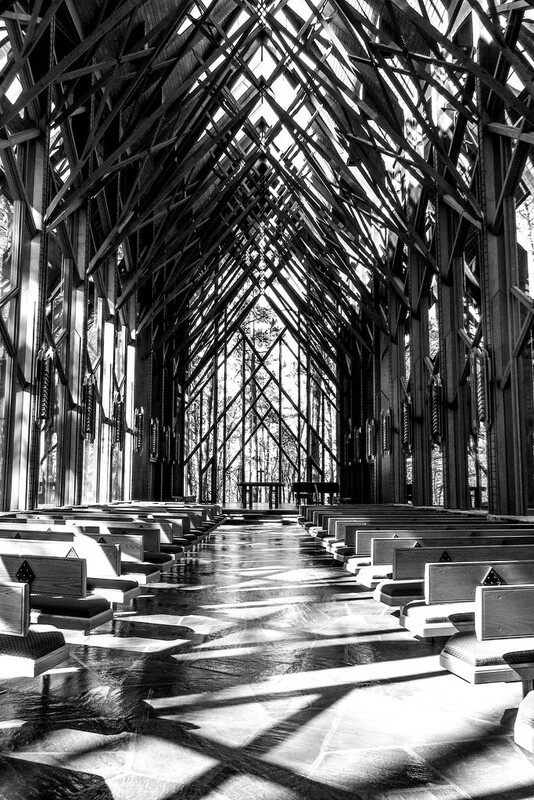 My friend shot the chapel from the front looking back. That's an awesome view. Never thought of it when I was there. Here's mine similar to yours: http://www.shirleyvphotography.com/Galleries/Travel/Road-Trip-2015/Road-Trip/i-nZrhM9T Here's my friends from the front back: http://www.joantilton.com/Art/Churches/i-D2pkS88/A She's an amazing photographer and has some great shots on her site. Amazing on the black background! Makes me feel as though I'm standing right there! I love the energy of all those interesting lines, and the light is spectacular. So well composed, too. Looks like a wonderful place for worship. Big FAV! @janetb And what I found exciting - from the photography part - is that I learned how to take the shadows out of the ceiling so that you could see those beams. I'm learning a few new things. @shirleyv The shots are so similar! And love your exterior shot of the chapel and carillon - not sure I could have gotten away with laying on the ground - my husband might have gone into hiding :) Joan's shot is terrific - never thought of looking at it from that angle. Got a beautiful shot. Joan printed it on a good size canvas and has it hanging in her house. I've not ventured into printing on Canvas yet, but it sure is awesome. So much to learn and try! You are right, spectacular on black! Such an amazing image! The lines and angles are breathtaking! Awesome shot. Really looks good on the black. Amazing lines, especially on black. What a gorgeous space. This is truly fabulous. All those lines look like Pick-up Sticks, except orderly! It is amazing on black Milanie. A superb shot - pick up sticks indeed! Lovely. Gorgeous lighting and love the shadow patterns! Exceptional capture, instant fav! Looks a very complicated structure. Like your POV. Stunning! I'm wowed by the lines of the structure and then by the shadows. How gorgeous! This is gorgeous! Lvoe the lines from the shadows! so much to look at here! Nice! Fav! This is very striking Milanie, great on black. Love al the lines and shadows Milanie. Stunning. So many lines! Stunning in b/w!